DG2 embroidered jeans never disappoint. I bought these on the rebound from a different pair I bought in the wrong size. The problem was I just LOVED the other jeans so much more and was so disappointed when I tried to exchange them and they were sold out. I thought I could settle. Rebound love never ends happily. Sadly I returned them. I really love unique jeans. These are beautiful! I got the 4 tall and they fit perfectly . The black is definitely not a jet black but I don't mind. I wouldn't say they look washed out or faded. Just a light black / gray. They are very soft and I'm 5'9 so I'm sooooo very grateful for the long length of the talls. Absolutely perfect length! The embroidery is stunning! I was at a mall today and didn't see any jeans as pretty. Great price too for such unique and well made jeans. Very happy. Awesome, this product/designers jeans are always great. 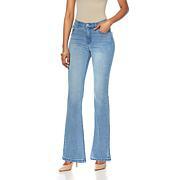 I love DG2 jeans. Virtual Stretch is fantastic. When they say size down or get your ideal size, do it. I got these in the Indigo size 6T. I am 5'9" tall and waist 34 3/4" and hips 39 3/4". 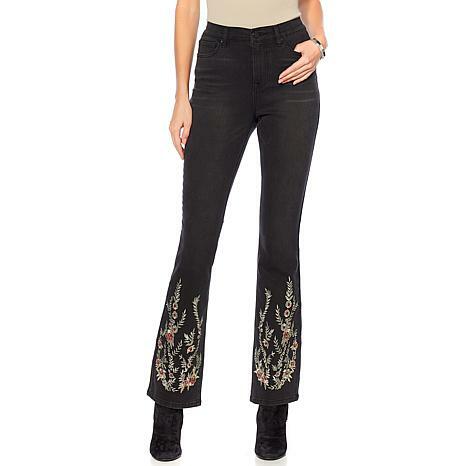 I have a little pooch but these jeans sit at the waist - thank you for that, and they really hold you in.With the great embroidery, I feel like I did when I wore jeans in the 70s that were hand appliqued by my college roommate. She had to cut the bottom legs open to insert a gusset to make them flare. 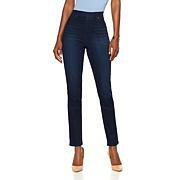 These jeans are beautiful and so comfortable! I have them in the black with the gold embroidery. I just wore them to a concert this week. They are dressier than some of the other embroidered jeans.